A seamstress has built a Garden Room in Cheshire for embroidering vestments for Catholic priests and church altar cloths due to high demand. 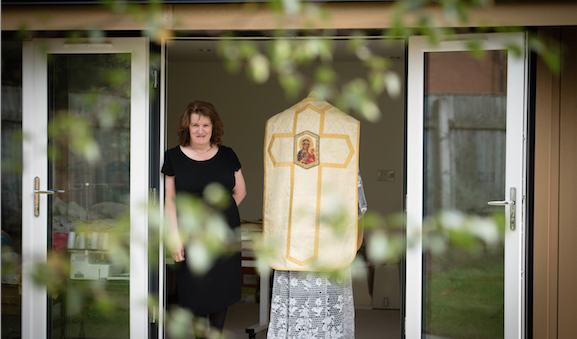 Dorothy McCarthy says the outdoor insulated Garden Room will enable her to continue her passion for sewing and embroidery, supplying clergy and churches, without cluttering up her home in Wilmslow, Cheshire. A student of the Royal School of Embroidery, Dorothy and her husband Frank began looking for extra space as her hobby grew. 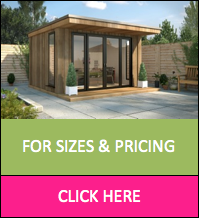 They chose Rubicon Garden Rooms to create the purpose-built sanctuary - its bespoke top-of-the-range units are now used for everything from Garden Offices to hobby dens, art or Music Rooms, Yoga Studios, teenage chill-spaces and annexes for dependent relatives. Dorothy, a former teacher, is thrilled with her new space. She said: “I really love my new Garden Room, it’s so light and airy and has plenty of space to lay out all my garments, sewing machines and all the other equipment I need. Dorothy explained how her hobby grew out of her religious beliefs. “We are Catholics and attend the Latin Mass at our church and joined the Latin Mass Society. Members got to know that I could sew and I began to be asked to repair vestment robes worn by the priests,” she said. “This expanded to altar cloths, houseling or communion cloths, and soft furnishings in priests’ houses. John Lyon, Rubicon's MD said “We worked closely with the couple to design the space that Dorothy needed for her sewing and embroidery, and within their budget. The sewing room, which is six and a half metres by four metres, has since been carpeted and equipped with lots of storage space by Dorothy and Frank, a retired BBC audio manager. The 12 spotlights ensure plenty of light for the close work Dorothy undertakes when she is sewing and embroidering, as well as tables for cutting cloth and her sewing machines, plus cupboard space.